Ron Sweetman first got involved in the Playground industry back in 1984. As a strong believer in the importance of children having fun outdoors, he quickly became passionate about playgrounds and the use of public spaces. He became an authority on accessibility in play spaces, and passed that knowledge onto his son, Andy. Following Ron's semi-retirement in 2018, Andy has swiftly become the "go to" person for playground equipment in Western Canada. Andy is also a strong activist in playground safety, leaning to allowing children to have exciting, thought provoking play challenges. He is an active member of Kinsmen, coaches and manages Lacrosse in Olds, and is an active golfer. The Sweetman family also believe deeply in being involved in their community including the donation of a large playground to the town and sponsoring local events. 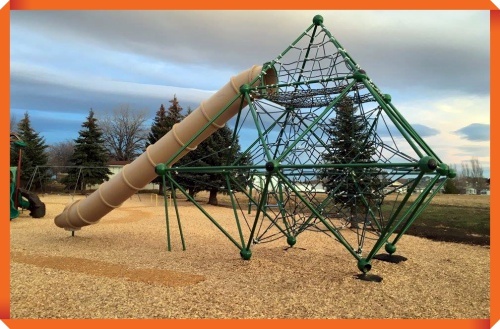 Through The Playground Guys, The Sweetman Group has won numerous awards and have trophies and testimonials from satisfied customers almost too numerous to mention. If you would like to contact a previous customer, please ask and we'll be happy to give you a list of testimonials. FREE Lifetime maintenance and inspection programme with every project. Pictured right: A sample of our Maximo series, a system that offers the most creative components! With larger decks, a variety of colours,a nd the most imaginative play activities in the playground market today, the Maximo series offers the perfect balance between durability and play value.